The presence of N-nitrosamines in water bodies used either for drinking water or recreational purposes may present serious health risks for humans, and pose new technical challenges for water utilities when present in hazardous concentrations. In this work, a fast and easy method was developed for quantitative analysis of sub-ng/L levels of N-Nitrosamines using liquid chromatography-tandem mass spectrometry (LC-MS/MS) proceeded by solid phase extraction. Method limit of quantifications (MLDs) for the nine N-nitrosamines studied ranged from 0.1 to 15 ng/L. 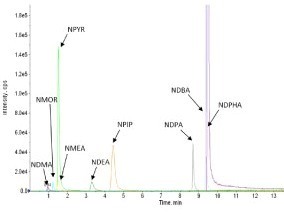 This research detected application of the method to untreated source water and treated water from various water treatment plants in Missouri and showed that only nitrosodimethylamine and N-nitrosodi-n-butylamine were detected above the limit of quantitation (with all other N-nitrosamines observed below these limits). The efficiency of removing N-nitrosamines from water using various types of powdered activated carbon was studied at three pH values in both reagent water and natural water. It was determined that hydrophilic N-nitrosamines can still be effectively controlled at typical pH levels with the appropriate dosage of powered activated carbon, even in presence of natural organic matters. These results have significant implications where there are high nitrosamine levels at the water treatment plant influents, especially those that are under the influence of upstream wastewater discharges.